Stoves are another piece of camping gear that people can end up spending a lot of money on, but you don’t have to. My stove needs are a little out of the ordinary, so your mileage may vary. Overall tl;dr: Do you really need a stove at all? Not if you’ll always have a campfire! If you’re on the fence about whether you need a stove, think about just getting a $5 isobutane stove from Amazon for now. 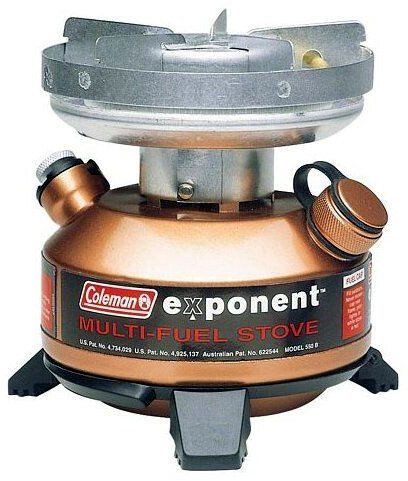 For my (admittedly specific) needs, I recommend the excellent and inexpensive Coleman Exponent Multi-Fuel, soon to be replaced by the very similar Coleman Sportster II Dual Fuel. The Exponent Multi-Fuel can be had for about $50 on ebay if you keep an eye out, and the Sportster II Dual Fuel for around the same price on Amazon any time. Not sure if you need a stove? These are about $5 on Amazon or ebay. You’ll also need fuel if you go with one of these. Types of stoves. We can use the type of fuel as a way to break down the stove options out there. Propane stoves like big heavy Coleman muilti-burner stoves use the same stuff as backyard barbecue grills, although usually sold in smaller containers. If you’re thinking of getting one of these big boys for car camping, I’ll suggest that a little more practice at making campfires, and cooking over them, might save you the investment. Maybe give that a try first. Isobutane stoves are especially popular with backpackers who only boil water to make freeze-dried meals on the trail. There are a couple of stoves that have some nice technical tweaks to make them very fuel efficient, most recognizably the JetBoil. If you won’t be making fires where you are planning to go, and will only be using a stove to boil water for rehydrated meals, JetBoils are made for that! They’re not cheap, but you can put together something similar using the knockoff $5 stove mentioned earlier paired with some of the heat exchanger pots from the cookware article, or you can get a Chinese JetBoil knockoff for about half the price of the real deal. Alcohol stoves can be light, and can also be homemade (aka free); Google tuna can stove for some nice homemade alcohol stove designs if you like making your own gear. Solid fuel stoves typically use hexamine, which smells like cat diarrhea if it gets out of its packaging, which it probably will. For me, that’s a dealbreaker, but solid fuel stoves do have their fans. Some older stoves and military meal heaters used to use trioxane rather than hexamine, but trioxane fuel is increasingly hard to find. Wood stoves are maybe the overall lightest option discussed here, because you don’t have to carry any fuel. They typically use clever gas-mixing baffles to burn twigs very efficiently. Some protected camping areas that won’t let you have an open campfire will still let you collect twigs for a small wood stove. 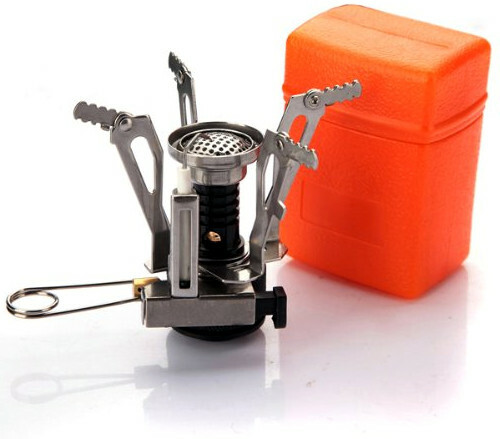 If I did a lot of stove-only camping, I’d be tempted to try a twig stove like the solo stove or the less efficient but cheaper siege stove. If you don’t want to pay the $60 for the solo stove or the $20-ish for the siege stove, you can also make your own solo stove. Most liquid petroleum fuel stoves use “White Gas”, but some are multi-fuel and can also burn things like kerosene or unleaded gasoline. Among liquid fuel models, there are the more commonly seen detached-fuel type, which has a fuel bottle separated from the burner by a hose, and the older attached-fuel design. The main difference is that if you run out of fuel in the middle of cooking, with an attached-fuel stove you’ll need to let things cool down before you can safely add more fuel. In the end, I think a liquid, multi-fuel stove is a great stove for all around use. Many people agree, and MSR makes several variations of this style with detached fuel sources. These MSR models are popular award winners, year after year, and are also lighter (although much more expensive) than the stove I use. My Stove: My own requirements for a stove are a little more unique than for some other kind of camping gear, which is why I’ve linked to a lot of the other excellent styles that might suit you better, depending on your needs. For myself, I never plan to camp in places that universally do not allow campfires, and if I have a campfire, I don’t use a stove. My stove is for when I show up somewhere and find out there’s a recent fire ban due to dry weather, and maybe potentially for use in a natural disaster. Because of this, I wanted a stove that would burn unleaded gasoline, which is cheaper and easier to find in remote places than many other fuels. I also wanted it to be cheap. 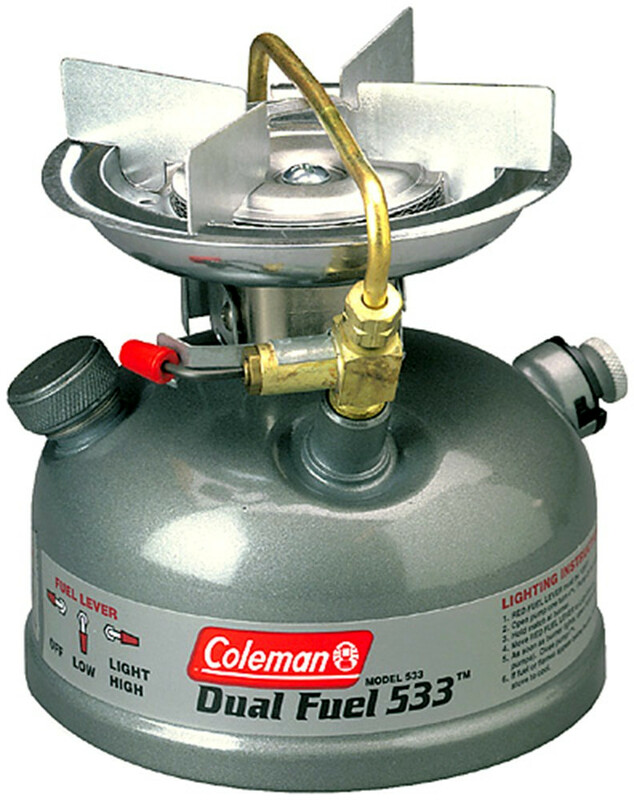 There are two stand-outs that meet these requirements: the Coleman Exponent Multi-Fuel, which is still very widely available, but appears to be being phased out for the nearly identical newer model, the Coleman Sportster II Dual Fuel. The older Exponent comes with an additional jet for kerosene, while the Sportster II only runs on either white gas or unleaded gasoline. Although ebay is far and away the cheapest price on the Exponent, you can also find the Sportster II for a great deal on Amazon . Wal-Mart also appears to carry the Sportster II in-store, if you’re looking for it off-line. A cursory reading of these stoves’ specs may make them seem much heavier than similar MSRs or detached-fuel models, but if you remember to correctly compare the stove and external fuel tank together for the MSR style, they’re actually not that much lighter than these much less expensive Colemans, especially if you’re not planning to carry yours that often (like me). Extra tips: You’ll need a little funnel to fill a liquid fuel stove like this one, which you can find at most stores from Wal-Mart to REI, right next to the cans of white gas, as well as online. The tiny chain that comes with the funnel is crap; throw it away and find another way to attach it to your gas can or stove. I use some paracord and a #2 steel S-biner. If you’re going with unleaded gasoline as fuel, you’ll also need a gas can if you don’t have one (it pays for itself in fuel savings). The cheapest place to get a small approved gas can is actually at any gas station. Safety stuff. Just to be clear in case you’re inexperienced: GASOLINE IS EXPLOSIVE! It’s a whole different animal from things like alcohol or lighter fluid, and it has to be treated accordingly. If you’re in any doubt at all about what this means, get it straight before using gasoline as a stove fuel, or for anything other than putting it in your car. On the same topic, never use gasoline to light a campfire; it’s basically the definition of the phrase “recipe for disaster”!